Give the unforgettable this Christmas. Finding the perfect gift for everyone can be an almost impossible mission. Give your loved one something they’ll remember forever: a RoofClimb Adelaide Oval experience. See incredible views in every direction from the roof of Adelaide Oval, from the Adelaide Hills in the east to the coast in the west. Embark on a RoofClimb adventure at twilight and watch the sun set in the west as the city lights come to life. Watch the city skyline come to life as you make your way across Adelaide Oval’s iconic roofline after dark. With a range of climb experiences to suit all the people in your life, an unforgettable Christmas gift awaits. Perfect for the whole family or that special someone. Whether you need a gift for men, for women, for teenagers, for adventure-seekers or just that one friend who’s really hard to buy for, a RoofClimb Gift Card is their ticket to an experience they’ll remember for years to come. 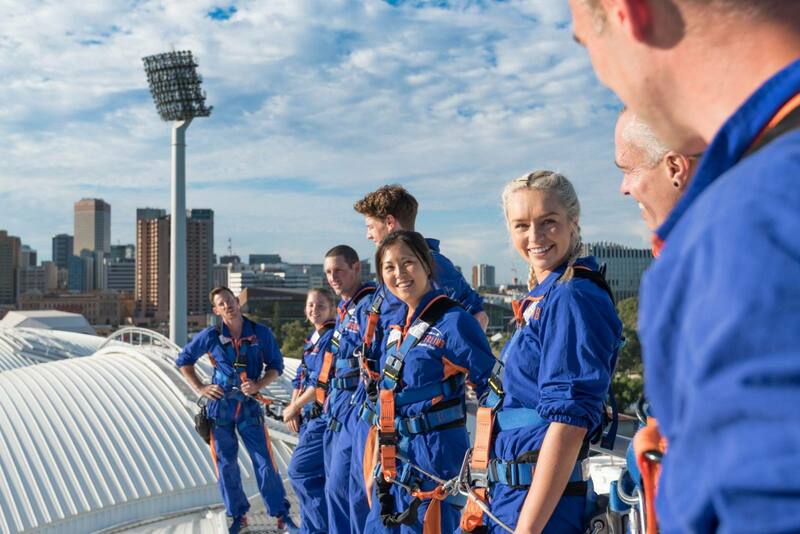 Give them something they’ll never forget: an Adelaide Oval RoofClimb!